I love making broths for supper. It has been a long and wet winter and on a cold night, nothing seems to warm the soul as much as a hearty dish of warm something! Most often than not, that something is a broth. Other nights, Dave will choose to make roasted vegetables. I always have vegetable stock in my freezer but more often than not, I cook on a whim and so I also keep boxed stock in my pantry – it is organic and probably more cost efficient to buy than making from scratch. This is a must have pantry ingredient in my opinion, but if you would rather make your own, I get it! I keep a box each of chicken, beef and vegetable stock, and depending on what flavour broth I am looking for determines which stock I use. It also means making dinner is quick and easy and if I have been working late that is important as I don’t want to come home from a long day to be faced with a long cooking time. Do you buy or make your own stock? On a similar note,, Most people do not know what title insurance is at least until they actually purchase a house or refinance and existing home mortgage. Even then the majority does not even give it a second thought. This is because it is simply one piece of a large volume of documents that are signed at closing time. As a result they are unaware that in most cases they are being overcharged for title insurance. Many title companies charge junk fees and overcharge standard fees since they know the customer has no idea what fees are part of the title insurance policy and will probably not look any further into it. The fact is that consumers should be more aware of what title insurance. If consumers were more educated they would understand that there is the potential to save $100’s, even $1000’s on title insurance and closing costs. I agree – broth and soup is so wonderfully warming and filling for dinner! I tend to make my own stock, but usually have some frozen homemade or store-bought fresh stock in the freezer just in case! This is such a flavorful broth. Never tried making it at home. I used to make chicken stock at home but have now stopped because it turns out to be very expensive. This is something I could attempt. I should cost out making stock! oooh! This is an interesting prawn broth! I don’t think I’ve ever had it like this before. So used to the Asian style one! haha… Or the western prawn bisque! It looks so good and healthy Tandy!! This sounds like a wonderful broth, Tandy. I sometimes make my own, when time and the right ingredients to hand allow. time is the key factor! I like to make my own stock (mostly chicken) but I do use good quality stock cubes/fonds as well. This sounds like a lovely and flavorful broth. I always have stock in my pantry but I also make and freeze it when I have the opportunity. Waw: a prawn broth! what a georgous & very tasty creation! I have never made my own broth before! Maybe, this is the recipe to win me over! This sounds lovely Tandy and I as am jumping on the bandwagon and trying the 5:2 diet that everyone is blogging about, I reckon this could be a suitably low-calorie dish for my fast days. Just made and devoured this! What a fabulously tasty dish and only about 200 calories a portion too. Loved the idea of extracting all the flavour from the prawn heads. A gorgeous soup and one I will definitely be making again. Thanks for sharing the recipe. I never have taken the time to make any stocks (shhh, don’t tell anyone) but this has me thinking it’s time to do so and keep them on hand. What an awesome flavor this would add to a dish! What a lovely tasty supper Tandy. 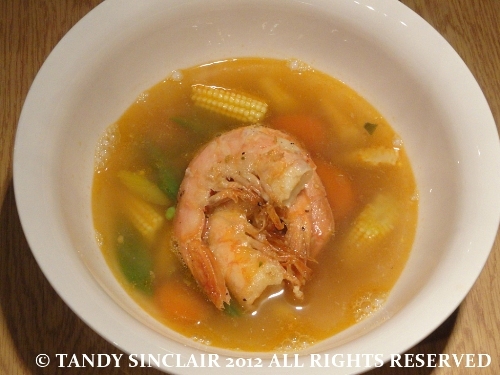 I have never considered making a broth out of prawns! Lovely recipe, Tandy. I do both. Whenever we have a whole chicken, I’ll make stock from the carcass and store it in the freezer. For all other stocks, it’s shop bought. We’ve such a collection of them that we’re going to have to stop accumulating them! I’ve Knorr stocks, Essential Cuisine stocks, Marigold stocks, Oxo beef stock (is there any better? lol) and so it goes on. If I haven’t made a stock, I use powdered Marigold Swiss Vegetable stock. I can’t get it in France, and I always ask visitors from the UK to bring a couple of tubs with them.